According to Rizwan’s family members, he was taken away by police from his home at Awantipora on Sunday night. On Tuesday morning, they said, they were informed of his death in custody. Late evening, police handed over Rizwan’s body to the family. A DAY after he was picked up from his home in south Kashmir for questioning, a 29-year-old school principal died in police custody Tuesday, triggering calls from separatists for a shutdown in the Valley. While the family of the victim, Rizwan Asad Pandit, alleged that he was “murdered” in custody, police said they have ordered a magisterial probe to investigate the cause of death. The National Conference, the PDP, the Congress and BJP ally Peoples’ Conference condemned the incident in the “strongest terms”, describing it as “unacceptable”, and demanded “exemplary punishment” for the “killers”. Rizwan had completed his M.Sc in Chemistry and a B.Ed, and was Principal at the Sabir Abdullah Public School in Awantipora. He was also running a coaching centre — Elite Group of Tutors — near his home. J&K Police said Rizwan was detained in connection with a “terror case” but did not provide further details. “In pursuance of a terror case investigation, one suspect Rizwan Pandit R/O Awantipora was in police custody. The said person died in police custody. In this matter while following the procedure laid down in section 176 of CRPC a magisterial enquiry is underway,” police said in a statement. “Yes, he had been picked up by J&K Police. We have ordered a magisterial probe into it,” DIG (South Kashmir) Atul Goel told The Indian Express. Rizwan had earlier been arrested last August on charges under the Public Safety Act (PSA) and lodged in the Kotbalwal jail in Jammu. “His innocence was proved in court. The PSA charge was quashed and he was released within five months in January this year,” said Mubashir, who holds an M.Sc in Biochemistry and teaches at Delhi Modern Public School in Pampore. According to Mubashir, a team of “uniformed men” raided their house on Sunday night. “It was around 11.30 pm… they also raided house of my uncle. 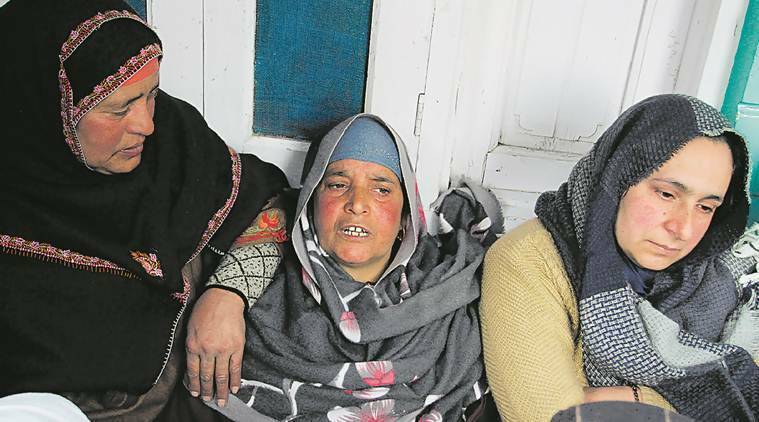 They were accompanied by police from the Awantipora station,” he said. “They locked the women in a room, snatched our phones and laptops, and searched the house. When they didn’t find anything, they took Rizwan with them,” Mubashir claimed. When the family approached police in the morning, he said, it was told that he was in “Cargo”, one of the bases of J&K Police’s Special Operations Group (SOG) in Srinagar. Rizwan belonged to a family affiliated to the Jamat-e-Islami, the socio-religious outfit that faced a crackdown by the state administration recently. His father Asadullah Pandit, a Jamat member, is a retired central government employee. Outside their home, neighbours described Rizwan as a “genius” who would “help the poor and needy”. “He used to teach a large number of students free of cost at his coaching centre,” said a neighbour, speaking on condition of anonymity. “I hoped custodial deaths were a thing of our dark past. This is an unacceptable development and must be investigated in a transparent, time bound manner. Exemplary punishment must be handed out to the killers of this young man,” NC’s Omar Abdullah posted on Twitter.